DEP’s Florida Park Service is in the process of updating the Unit Management Plan for Suwannee River State Park. Citizens are invited to attend a public hearing to learn more about the proposed plans for the state park and to provide their comments. Please review the public notice, agenda and draft plan. Copies may also be obtained by emailing Craig.Liney@dep.state.fl.us or calling 386-362-2746. The public is invited to review and submit comments to the Division of Recreation and Parks at FL_StateParkPlanning@dep.state.fl.us until Aug. 10, 2016. 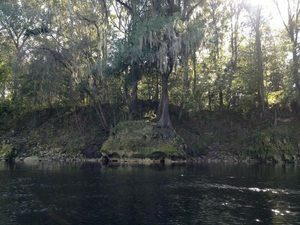 This entry was posted in River and tagged cammpsite, camping, conservation, DEP, Department of Environmental Protection, events, FDEP, Florida, Live Oak, north Florida, parking, river, south Georgia, SRWMD, Suwannee River, Suwannee River Water Management District, watershed, WWALS, WWALS Watershed Coalition on July 21, 2016 by jsq. Sent yesterday to the Chairman, the other five elected Lowndes County Commissioners, and the County Clerk (PDF). They meet again 5:30PM Tuesday evening, April 25th 2016. Invite the U.S. Army Corps of Engineers to investigate on site and on paper the numerous omissions by Sabal Trail of springs and underground water transmissivity in what it told the Federal Energy Regulatory Commission; .please see the letter from WWALS to the Army Corps, attached with the letter from WWALS to you of April 12th. Ask our U.S. Congress member Austin Scott (GA-08) to join the four Georgia Congress members who have already asked FERC to fix its processes or deny a permit for Sabal Trail. Join the hundreds of organizations and thousands of individuals who have already asked the U.S. Congress to call in the General Accounting Office (GAO) to review FERC’s permitting processes. 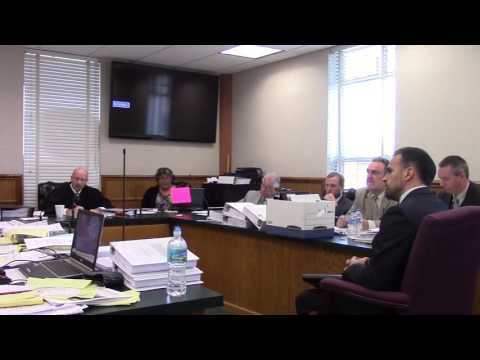 Please find appended further information about the issues the Chairman raised in the VDT of eminent domain, in differences in regulation of oil and gas pipelines, and in environmental and safety issues of natural gas pipelines. 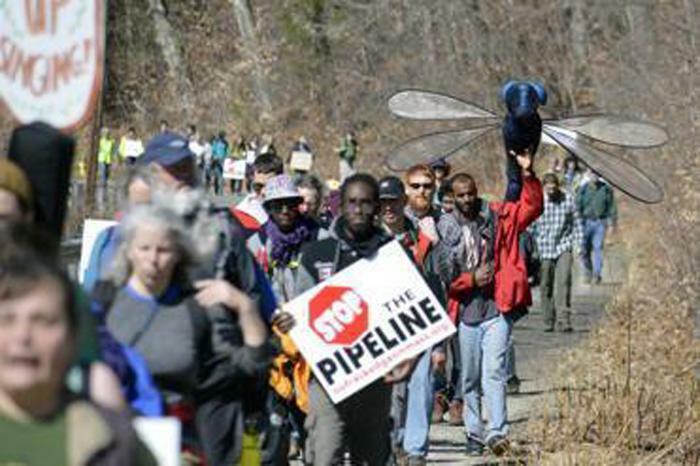 Since I wrote to you on April 12th, two more major natural gas pipelines have run into serious problems. This entry was posted in Aquifer, History, Law, Pipeline, River and tagged Aquifer, Austin Scott, Bill Slaughter, caverns, Clay Griner, conservation, Constitution Pipeline, Delaware Riverkeeper, Demarcus Marshall, DEP, Department of Environmental Protection, easement, endorsement, Federal Energy Regulatory Commission, FERC, GA-08, GAO, General Accounting Office, Georgia, history, John S. Quarterman, Joyce Evans, Kinder Morgan, Law, Lowndes County, Massachusetts, Michael Praats, New Hampshire, New York, north Florida, Northeast Energy Direct, Paige Dukes, pipeline, river, Sabal Trail Transmission, Scott Orenstein, sinkholes, south Georgia, Spectra Energy, springs, transmissivity, U.S. Army Corps of Engineers, USACE, Valdosta Daily Times, VDT, watershed, Williams Company, WWALS, WWALS Watershed Coalition on April 25, 2016 by jsq. Despite being on FDEP’s permit announcement list, I never got anything about a Sabal Trail permit. After much digging, the other day I found that FDEP went ahead and issued the Sabal Trail permit 22 January 2016 (PDF), conveniently before FERC issued certificates 2 February 2016. That FDEP permit was also before the appeal deadline of 15 February 2016 in WWALS v Sabal Trail & FDEP. They did not copy the petitioner in that case, namely WWALS. 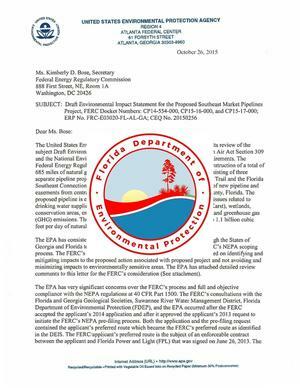 They did copy Audubon Florida, which, as you may recall back in October sent FERC a letter supporting Sabal Trail (and then tried to walk back part of it). A letter that EPA chose to mention by name to the Army Corps of Engineers, while not naming Sierra Club or WWALS in opposition. Apparently if you go along with FDEP you get preferential notification. This entry was posted in Pipeline, Quality, Quantity, River and tagged appeal, Audubon Florida, Charles Lee, conservation, Department of Environmental Protection, Environmental Protection Agency, EPA, FDEP, FERC, FL-DEP, Florida, Florida Power and Light, Florida Southeast Connection, FPL, north Florida, pipeline, quality, Quantity, river, Sabal Trail Transmission, Santa Fe River, Sierra Club, south Georgia, Spectra Energy, Suwannee River, U.S. Army Corps of Engineers, USACE, watershed, WWALS, WWALS Watershed Coalition on February 29, 2016 by jsq. 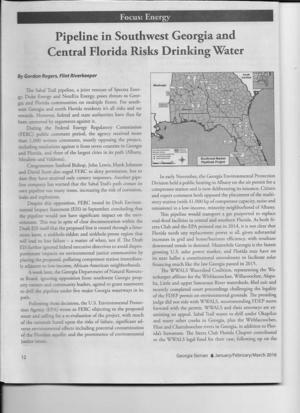 Apparently fracked methane is Sierra Club Georgia’s next fight now that Keystone XL is dead, since almost its entire January/February/March issue of Georgia Sierran is about opposing natural gas: PDF. See for example “Why Natural Gas Is Not a Climate Solution”, by Joshua Hanthorn. And “LNG Puts Savannah at Risk”, by Karen Grainey and Stacey Kronquest. Karen is chair of the Coastal Group of Sierra Club Georgia. Pretty much everything in that article also applies to Jacksonville, and quite likely to Palm Beach and other locations in Florida very soon. The Sabal Pipeline, a joint venture of Spectra Energy, Duke Energy, and NextEra Energy, poses threats to Georgia and Florida communities on multiple fronts. For southwest Georgia and north Florida residents it’s all risks and no rewards. However, so far federal and state authorities have thus far been unmoved by arguments against it. During the Federal Energy Regulatory Commission (FERC) public comment period, the agency received more than 1,000 written comments, mostly opposing the project, including resolutions against it from seven counties in Georgia and Florida, and three of the largest cities in its path (Albany, Moultrie and Valdosta). This entry was posted in Aquifer, Pipeline, River and tagged AGL, Aquifer, Chattahoochee River, Colleen Kiernan, conservation, DEP, Department of Environmental Protection, export, Flint River, Florida, Floridan Aquifer, fracking, Georgia, Georgia Power, Gordon Rogers, Joshua Hanthorn, Karen Grainey, Keystone XL, LNG, north Florida, Ochlockonee River, Okapilco Creek, pipeline, river, Sam Collier, Santa Fe River, Sierra Club, south Georgia, Southern Company, Stacey Kronquest, Suwannee River, Tom Fanning, watershed, Withlacoochee River, WWALS, WWALS Watershed Coalition on January 24, 2016 by jsq. Does this sound like a level playing field to you? Basically Sabal Trail claims “reasonable assurances” mean the pipeline can be completed and that’s a public good for the state of Florida, nevermind any destruction or hazards, while WWALS would have had to demonstrate specific direct damages to many of its members because of pipeline installation just to get standing. A Spectra Energy executive from Houston, Texas automatically has standing to claim safety using evidence from other pipelines and even other pipeline companies,explicitly referencing the U.S. Pipeline & Hazardous Materials Safety Administration, while WWALS and its local members in Florida are precluded from introducing any evidence about safety in the same case, or so Sabal Trail seems to say in its objections filed today 4 January 2016 (PDF) to the judge’s Order in WWALS v Sabal Trail & FDEP. Seems like the limestone underlying the Floridan Aquifer are not the only cracks and fissures in Florida. This entry was posted in Aquifer, Law, Pipeline, River and tagged Adminstrative Law Judge, Alan Lambeth, Aquifer, Bram D. E. Canter, conservation, DEP, Department of Environmental Protection, FDEP, FL-DEP, Florida, Floridan Aquifer, Hamilton County, Houston, Jasper, karst, Law, limestone, north Florida, pipeline, river, Sabal Trail Transmission, Santa Fe River, south Georgia, Spectra Energy, Suwannee County, Suwanneee River, Texas, watershed, WWALS, WWALS Watershed Coalition on January 4, 2016 by jsq. 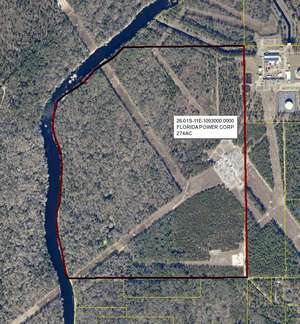 Why does Duke Energy now want to dispose of industrial wastewater from its Suwannee River power plant in Suwannee County? Why did Duke apply for a water permit for the same plant the same day that the U.S. Army Corps of Engineers asked for comments about Sabal Trail? Why does Sabal Trail want the same type of permit? This entry was posted in Pipeline, Quality and tagged conservation, DEP, Department of Environmental Protection, Duke Energy, FDEP, FL-DEP, north Florida, pipeline, Progress Energy, quality, river, Sabal Trail Transmission, south Georgia, Spectra Energy, Transparency, wastewater, watershed, WWALS, WWALS Watershed Coalition on November 29, 2015 by jsq. National news notes Florida doesn’t want DOAH to listen to EPA about Sabal Trail, after WWALS asked DOAH to do so. The Sabal Trail pipeline, a joint venture of Spectra Energy, Duke Energy and Florida Power & Light Co.’s parent company, would extend 515 miles from central Alabama to Osceola County. The project, which covers more than 260 miles in Florida, faces a legal challenge to a state permit in Florida from an environmental group named the WWALS Watershed Coalition. This entry was posted in Aquifer, Pipeline, Politics, River and tagged Aquifer, Bruce Ritchie, conservation, DEP, Department of Environmental Protection, Environmental Protection Agency, EPA, FDEP, FL-DEP, Florida, Floridan Aquifer, Governor, north Florida, pipeline, Politico, Politics, Rick Scott, river, Sabal Trail Transmission, scathing, south Georgia, Spectra Energy, Suwannee River, watershed, WWALS, WWALS Watershed Coalition on November 27, 2015 by jsq.